Gerldine Cahill (2nd Place Winner) and Micheal Cahill (1st Place Winner) at O'Briens Garage Midleton. The winner of the latest Midleton Credit Union’s car draw was presented with his prize last Saturday, 4 November. 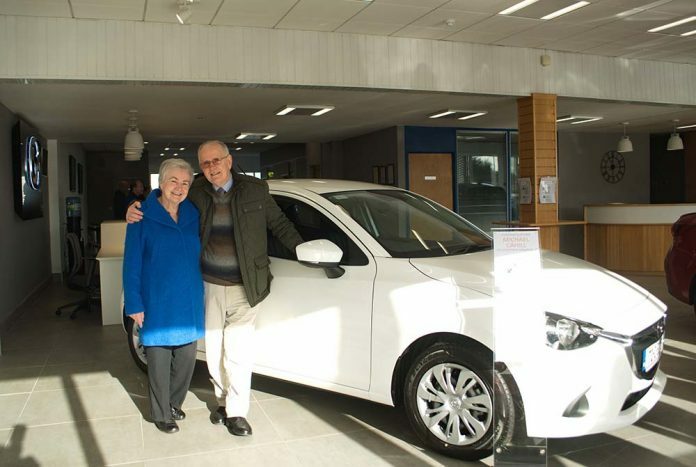 Michael Cahill was the winner of the bi-monthly car draw held by Midleton Credit Union and Mr Cahill along with his wife Geraldine collected their brand new Mazda2 at O’Brien’s Garage, Midleton, this past weekend. The keys were handed over by representatives of Midleton Credit Union including John Fenton, Margaret Bernard and Kathleen Woulfe, with Phil O’Brien representing O’Brien’s Garage. Midleton Credit Union, with 19,000 members at present is one of the largest credit unions in Cork, serving a common bond area that includes Midleton, Carrigtwohill (which is the location of its sub-office), Castlemartyr, Mogeely, Dungourney, Ballynoe, Whitegate, Aghada, Ladysbridge, Ballymacoda, Ballycotton and Cloyne. Members of the Credit Union can enter the bi-monthly car draw for €60 for six draws, with entrants also having the chance to win bonus cash prizes throughout the year. To enter the draw, enquire at the Credit Union’s office at Main Street, Midleton. The next Credit Union Car Draw will occur in the run up to Christmas, most likely on the Friday before the Credit Union closes for its Christmas break.